Bad filmmakers who make bad films don’t spark long-winded epics about their awfulness; they’re merely living down to their potential and surprising no one in the process. It’s the good directors who make bad films that move people to such vitriol as frustrated audiences tear their hair out at quality work dragged down by bad ideas (and vice versa). Bad things will happen in life – jobs will be lost, husbands will leave one day and never look back, parents and children will cut each other from their lives – and that certainty allows an amount of preparation and acceptance. It’s the element of surprise, of the unpredictable, which causes such disarray and negative feeling; the irony that it is also often the source of joy is a prime mover for suspension and dramatic tension but the pitfall of disappointment looms large. It’s a trap young teens Rebecca (De Jonge) and Tyler (Oxenbould) are all too aware of as they have been trying for years to crawl from under the psychic trauma of their father abruptly walking out of their lives several years earlier – a moment which they thought was the worst thing that would ever happen to them. It’s also a trap writer-director M. Night Shyamalan must be aware of by now as well, having blundered into it several times, leaving audiences wondering how someone who obviously knows how to make character, narrative and theme work together manages to make self-defeating choices of tone, pace and casting. The upside to letting good filmmakers who’ve had missteps continue to make new movies is that each work is a blank canvas, a chance to reexamine old decisions and try again. 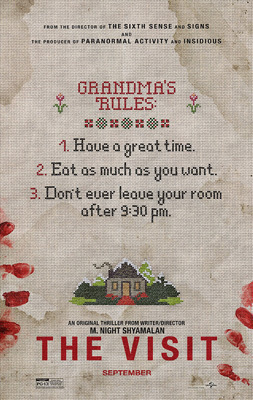 The Visit benefits greatly both from not being judged by the detriments of his previous work and from Shyamalan’s own desire to return to earned suspense, the kind which is essentially a character piece onto which the weirdness of terror (and the terror of weirdness) gradually super imposes itself. Unfortunately, it also suffers from the conceit of the film as a documentary being produced by budding director Rebecca who has decided to spend a week with the grandparents she’s never met to get the lowdown on what went wrong between them and her mother in order to heal old wounds. Shyamalan has been one of the few proponents of classic character-oriented suspense, a form mostly uninterested in easy jump scares or long-winded exposition which eats up screen time and communicates nothing. Rather The Visit is primarily interested in the narrow angle of view before its (unavoidable) lens, one usually held by the two children who turn out to be more than capable of carrying the film on their backs. Charming, insouciant and a little bored, their focus is entirely (and believably) on themselves, giving them the space to plum complex emotions – the scenes where they interview each other on how each takes responsibility for their father’s departure is impossibly affecting – while also allowing the danger they are in to build slowly on the sidelines. Shyamalan shows how well he understands the need for a push and pull between fright and relief, between build and release and that anticipation rather than payoff is the real joy of the genre. He rarely puts his fingers on the scales and wisely keeps from making the plot completely transparent – for these 90 minutes we are the children and they are us – creating tension slowly through keenly-placed red herrings and providing regular release through humor. In fact, The Visit is the (intentionally) funniest and often most human film Shyamalan has made with the fear/laughter dynamic keeping the audience off balance and making the moments of dread all the more palpable as the siblings slowly realize there is something very, very wrong with their grandparents. Good suspense is a dance, one which requires its choreographer above all to understand that it exists atop the shoulders of suspension of disbelief. And the choice to continually remind the audience that a camera is present and recording all of these moments makes that disbelief impossible to maintain. Some of that is down to Shyamalan’s inability to commit to the found-footage genre entirely (or perhaps his attempting to transcend it). Not one to just sit a camera on a shelf and leave it, he (and his on-camera cinematographer, Rebecca) are on a constant quest for cinematic angles and set ups which often include a discussion of why those choices are made and how they affect an audience. It makes for an interesting dissertation on the director’s craft, but it also continually removes the audience from the story they are observing and reminds them that they are in his hands. Much thought has been given on how to use the style to the film’s advantage – particularly the children’s attempt to covertly record one of their Nana’s nighttime romps through the house while they sleep in their room, unaware of what’s actually been causing the thumps outside. They also niftily upset and disorient the audience during the more traditional climax as the cameras transform from quiet observers into tools and weapons, bashing open doors and villains’ heads. The contrivance of having to carry a camera into every scene and use it as an element of point-of-view keeps the audience always aware that is happening and too aware when it makes no sense. Still, it’s too easy to suggest that Shyamalan doesn’t know what he’s doing or that the successes he’s had were flukes or luck. There is such good work on display in The Visit that it is impossible to plausibly make the case – just as it’s impossible to understand why he went with the found-footage conceit in the first place. The end result is an anomaly in his oeuvre – neither unabashedly terrible nor extremely good. The Visit is a well-developed and well-crafted piece of classic suspense which continually undercuts its own belief in itself. There’s too much good in it to call it a failure, but in many ways The Visit is less than the sum of its parts. That said, the fact that bad exists does not diminish the good and rather than a cause for yet more anguish and name calling is a sign of hope that with time the old Shyamalan may return in full.